What a thrill it was to see the Apollo 11 astronauts inside their quarantine trailer in Hawaii! In July 1969, my brother was serving in the Air Force, and was able to bring his family, including me, visiting from Illinois, to Hickam Air Force Base for this exciting and historic event. Due to possible moon and space contamination, the three astronauts – Neil Armstrong, Edwin “Buzz” Aldrin, and Michael Collins – were placed in an airtight Airstream Mobile Quarantine Facility trailer aboard the aircraft carrier USS Hornet after their recovery from the Pacific Ocean. The ship reached Pearl Harbor on July 27, 1969. After arrival ceremonies, the quarantine trailer was lowered to the dock, and transported on a flatbed loader to Hickam Air Force Base, through the streets of Honolulu, followed by cheering crowds. At Hickam Field, the trailer would be loaded onto an Air Force C-141 transport aircraft and flown to Texas to complete the 21 day quarantine. We were able to clearly see the shadows of the waving astronauts in the window of the quarantine trailer, and we watched as the Airstream was slowly loaded into the cargo hold of the transport aircraft. 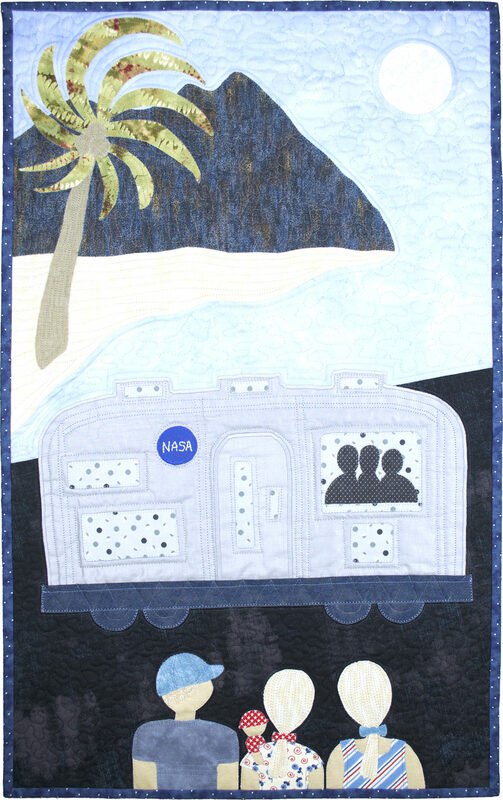 My quilt was created and inspired by memories and snapshots of that eventful day. The sandy beach, Diamond Head, and palm tree signify beautiful Hawaii, with the moon, sky and ocean in the distance. What an honor it was to see the Apollo 11 astronauts, a moment I’ll always treasure. Machine pieced, machine appliqued, hand embroidered, machine quilted. Cotton fabrics, cotton threads, rayon threads, fusible web, cotton batting.